Beta (Day 2): Giant Turtles and Huge Bugs! Figuring out what's wrong with the old terrapin. I finished the Panderan starting zone late last night and got to actually talk to the giant turtle that we’d been riding on all of this time. The starting zone is very well done and a feast for the eyes. I transferred some of my level 85 toons over from the liver servers as well and began the 85-90 questing in the Jade Forest. 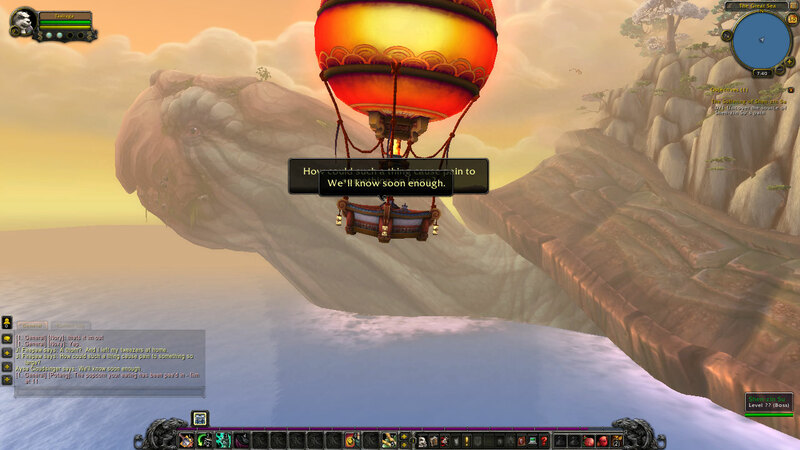 As of right now you can be teleported straight to Pandaria by an NPC named Ka Pow who is standing right next to the main mailbox outside of Garrosh’s building in Orgrimmar. Eventually there will be a Zeppelin ride or a boat or something to take you there. You’ll want to take the teleport to the Crash Site as that’s where the quest-line starts. 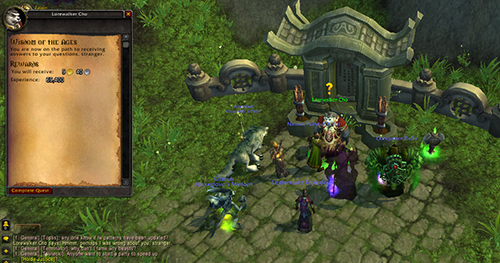 There are two other options right now, you can ignore them until you’ve progressed far enough in the quest line. Most of the quests work fine, however, with the current waves of invites going out there is a LOT of competition for MOBS and resources. One bugged quest stands out as a particular pain. It’s called “Wisdom of the Ages” and it requires you to maintain a meditative state for a period of time. To do this you keep the bar that pops up in the center of the indicator gauge. Use the “relaxation” button to move the bar left and the “focus” button to move the bar right. Now the problem is that the quest is bugged and it doesn’t tell you how long you have to maintain the meditative state. So you could go on and on and never complete the quest. Or just get so frustrated that you exit. But then guess what? You’re stuck in the lotus position and can’t move. So here are a few pointers to help you get though this buggy quest. Hopefully they will fix it soon. If the quest giver is not talking to you and moving around you hitting you in the head, the quest is bugged. Exit the “vehicle” and start again. If the vehicle interface is gone and you cant get out of the sitting position, typing /leavevehicle should do the trick. Logging out and then back in will also work. It IS possible to complete this quest. Be patient. « Made it to the Beta!